Here is another cute button in my new buttons series. This one is crocheted in a few puff stitches with a slip stitched edge. And you can stiffen to use as a real button, or use it as an embellishment for baby accessories such as headbands or a hat. With a few experiments I discovered that you can crochet this up in three ways. 1.) Follow the pattern as instructed working the entire button from one side and using only one color. One color and worked from one side. 2.) Change your color for the slip stitches around the edge. 3.) And three, turn after the first round and slip stitch on the wrong side. This then, makes the “Wrong Side” become your “Right Side”. I love the swirly textures that naturally formed on the wrong side. Turn and work the slip stitches from other side to make it the Right Side. Yarn: For best results use a baby yarn #3 baby yarn, or a #4 will work as well. Puff St: [Yo, insert hook and pull up a loop] twice (5 loops on hook), yo and pull through all loops on hook. Ch 1 to close. Rnd 1: Ch 2, work 5 puff sts in 2nd ch from hook; join with sl st in first puff st.
Rnd 2: Sl st in next st and in each st and ch around; Fasten off and join with invisible join. Follow directions as per first one, but join with a tight sl st join at rnd 1 and TURN before starting rnd 2. 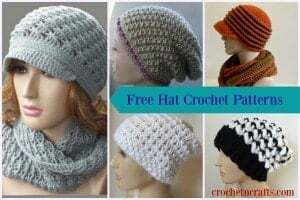 You can also visit CPB for more FREE Buttons Crochet Patterns.